When art and food come together, a more immersive dining experience is created. La Boca Restaurant in Sydney not only has Argentinian cuisine to feast on, but thanks to vibrant murals by Blackbook Ink, a visual feast is also to be enjoyed. Allow the art to enhance your exotic dining, and blur your line between restaurant and gallery. Blackbook Ink have mastered the art of turning that which lingers in imagination into vibrant, intricate, tailored murals. Having done street art across Sydney for twenty years, they reform the traditional idea of graffiti, showing the creative potential that lies within. 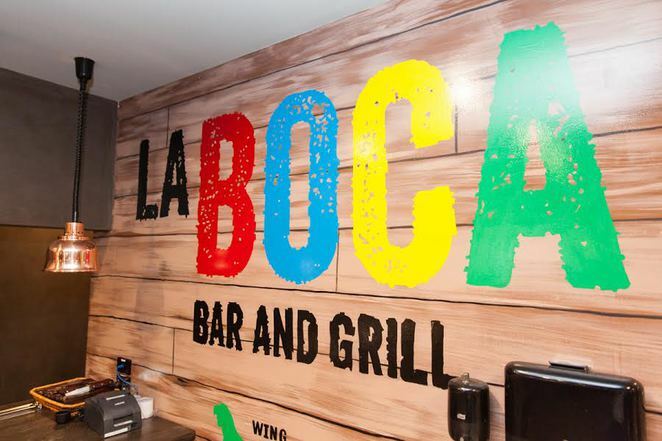 They have applied their creation of larger than life illustrations to indoor feature walls, with La Boca being one of their bubbly end products. The creations in La Boca were a rather large project for Blackbook. It involved painting a sprawling feature wall reminiscent of the colourful village by the same name in Argentina. A second wall was also crafted with a wooden texture and shiny, hand-painted signage. 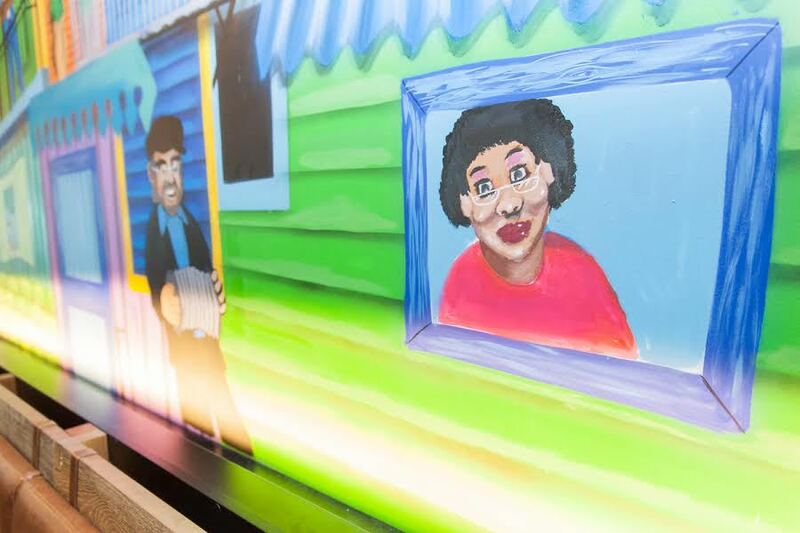 With spray-paint and acrylic, the colourful homes and pedestrian streets of La Boca are depicted on the feature wall. This dining backdrop allows for greater immersion in the culture throughout your meal. Detailed with street-musicians, residents and tango dancers, one can truly envisage savouring aromatic Parilla and Asado flavours on the footpaths of the lively town. "Art makes a room. It is part of the culture of the place" as Eric Rimmington says. Blackbook Ink really brings this idea to fruition in La Boca. As we relish courses, sip on wine, and draw the dining experience out over hours, we want the space to not only feel alive but provide food for the mind. The masterpiece of a mural will have you noticing something new every time it catches your eyes - beats staring at the same white wall. 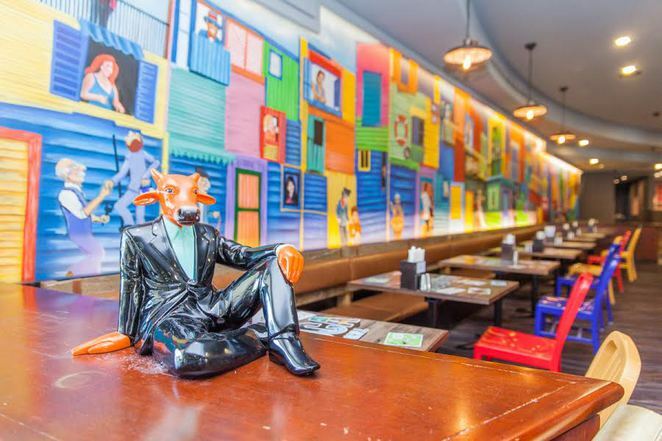 Blackbook Ink has done a passionate and thorough job of merging a gallery full of culture, with a restaurant showcasing the range of flavours that Argentina boasts; blurring these two in a beautiful way. If you have a vision for an urban, funky addition to your interior, or a want to powerfully portray the spirit of a place, get in touch and watch this come to life. Why? Feed your body and your mind. When: 7 days - breakfast, lunch, dinner. Where: La Boca Restaurant, Mascot.